Hi guys, and welcome to a new Top Ten Tuesday. Today is a topic that I’ve been wanting to do for a while now, and that is… quotes! I’ve always loved quotes. When I was younger I kept a little quote book where I wrote down all the quotes that meant something to me. That could be anything from lyrics to movie or tv quotes, to book quotes. It could be inspirational, moving, relatable or funny. Just, beautiful words put together to make beautiful quotes. So that’s the post for today. Quotes. Of course these are not all of them, because I could never choose just ten favorites. 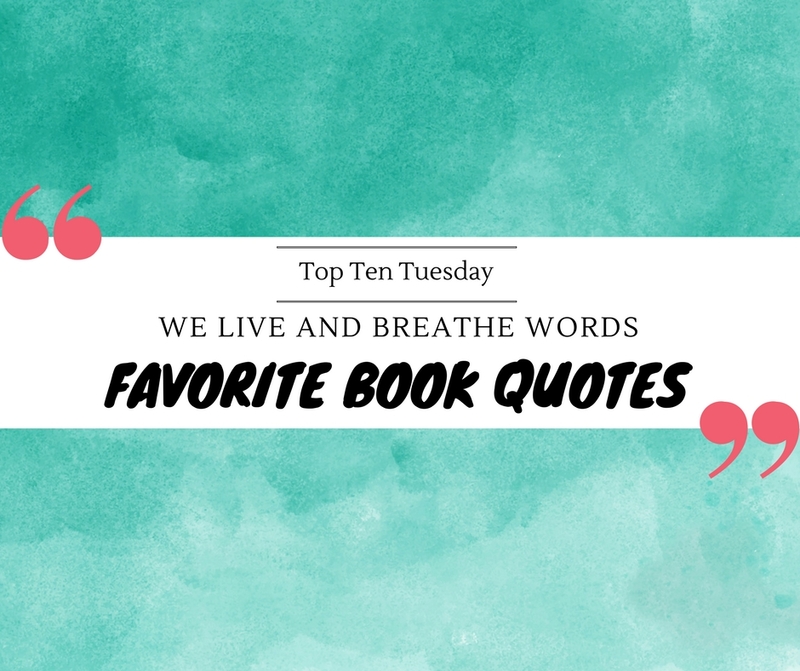 So these are just a completely random selection of ten bookish quotes I love. Who knows, maybe I could make this into a more regular feature. Anyway, enjoy! Well… not only is this a lovely inspirational quote, but it’s also a quote by my all-time favorite fictional character: Samwise Gamgee. I love him so much, he can talk about potatoes and I would be there, hanging on every word and buying picture frames to hang his quotes in. I love how, even though nighttime and darkness are often used in imagery as something negative, something to be feared (ex: creatures of the night, keeping someone in the dark, dark times…), this quote gives us a whole other way of looking at it. Honestly, I think I could quote practically every chapter from The Raven Cycle. It is just that beautifully written. But this quote has stuck with me because it so beautifully describes the relationship between Blue and her Raven Boys. Who wouldn’t want a friendship like theirs? The writing style of Tahereh Mafi’s Shatter Me trilogy is pretty hit or miss, but for me it was a pretty big hit. This quote especially has always stuck with me. Well, it is one of my favorite series and I must admit I’ve been thinking about having ‘Rattle The Stars’ as a tattoo someday. I read More Happy Than Not last year and I can’t remember the last time a book made me cry this much. It was brutal, honest and raw and made me fall in love with Adam Silvera’s writing style. This quote especially hit me hard. As an anxious fangirl myself, I related to this book quite a lot. Especially this quote made me think and reflect on my view on fictional worlds versus the real one. Another book that could be quoted from beginning to end, but I chose this quote because I relate to it so much. Both in writing or in talking, words can be either beautiful or brutal and in the end all we can do is hope we made them right. This entire trilogy is so gorgeously written, but this quote on happiness is at the top for me. I believe it’s one of the best descriptions of happiness I’ve ever read. are you someone who loves quotes? Are Any of these quotes your favorites too? Any other favorites? That’s a great LoTR quote! Love it! And the Fangirl one too- there were so many quotes in that one. And I like the Blue one also. So true, Fangirl is filled with great quotes! Ohhhh that Raven Cycle quote is so nice! ? I love quotes, too. Thanks for sharing these powerful ones. Thanks so much! 🙂 I do love quotes so it’s definitely a possibility this will be a recurring feature! Great list! I love that Lord of the Rings quote! I absolutely loved this post Lindsey! Great job. I haven’t read Crooked Kingdom yet, but need to and the quote makes me want to read it all the more. I also really love the one from the amazing Throne of Glass. This one made my day. I’m definitely going to have jot some of these down. Thanks for sharing! Great post! I’m usually not much of a quote person, but these are great ones 🙂 I really love the LotR one and the Throne of Glass one. These are all such great choices! I used to be obsessed with quotes when I was younger. I had a notebook filled with song lyrics I liked and had another one with book quotes I liked (I still have that one lying around somewhere). That Kaz quote melted my heart! I love him so much! I still need to finish the book. I was getting bored with it so I had to take a break. Yes, Kaz is such an amazing character <3 Hope you'll still enjoy the rest of Crooked Kingdom! These are beautiful. You need to get a few of these printed and framed. They make my heart smile. I love quotes and often collect them as well. Some of these books have so many good quotes it would be hard to pick a favorite. Love the post! It is so much fun to collect quotes 🙂 Glad you enjoyed these ones! Great topic! I love quotes too and am always collecting ones that I find relateable. These are perfect! Wow! I loved the quote from TOG! Never realized that was in the book! I love the Throne of Glass, Book Thief and Blue Lily, Lily Blue one!